Gardaí will be able to use handheld devices to instantly tell whether a vehicle is insured, as a new "hotlist" of rogue drivers will be rolled out by the end of the year. Officers will scan a number plate to see if a vehicle is insured when they pull over a car on the road. This will be linked to the new database of uninsured drivers. The move is an attempt to clamp down on the rise in the numbers taking to the roads without insurance - and should ultimately lead to a reduction in premiums for law-abiding motorists. Experts said the use of the technology will mean uninsured drivers will have nowhere to hide. It is estimated there are around 150,000 uninsured drivers. Insurance companies are providing gardaí with lists of vehicles that have insurance cover on them and those that do not, based on the licence plate number and the driver's name. This list is then being loaded on to the automatic number plate recognition system operated by gardaí. 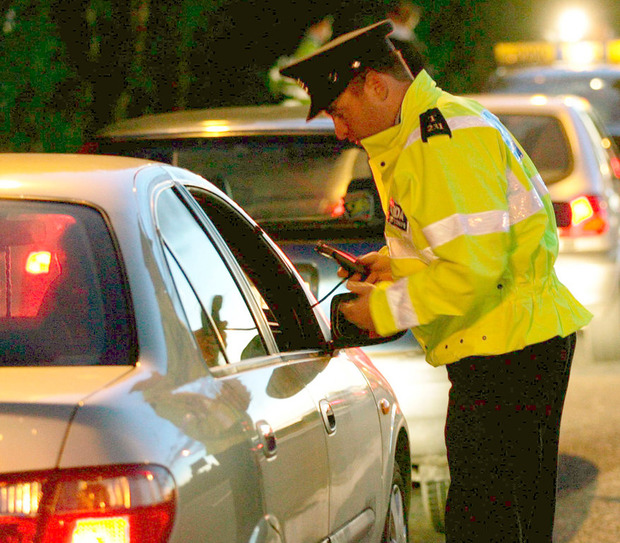 It is expected that gardaí will have handheld devices, based off a specially designed app, that will allow them to check a car at the roadside. The new system is set to be rolled out by the end of this year, according to the latest progress report on the Government's Cost of Insurance Motor Working Group. If it works to reduce the number of uninsured drivers, the new measure is expected to lead to demands from drivers that insurers cut premiums. Motorists who legally pay their insurance premiums have to fund pay-outs for accidents caused by uninsured or unidentified drivers through the Motor Insurance Bureau of Ireland (MIBI). There are close to 2,800 insurance claims a year due to uninsured and unidentified drivers. Untraced incidents, which are commonly referred to as 'hit-and-runs', occur when the driver of one of the vehicles involved departs the scene of an accident without providing information to the other parties involved. The MIBI is a not-for-profit company established to compensate victims of road traffic accidents caused by uninsured and unidentified vehicles. It is funded by the insurance companies in Ireland, whose costs in turn are then added to customers' motor premiums. The operation of the MIBI costs €60m a year, which works out at €30 on the average premium. According to the seventh progress report of the insurance working group, the new database is ready to go. "Phase one of the initial testing has been completed as well as further testing in conjunction with the new An Garda Síochána handheld devices which are also being trialled." Peter Boland, of the Alliance for Insurance Reform, said the new database will flush out uninsured drivers. "We look forward to seeing this key reform in place by the end of the year so that uninsured drivers will have nowhere to hide," he said. Mr Boland called on insurers to use the savings that result from not having to make such large payments from customer premiums to the Motor Insurers Bureau to lower driver premiums. Conor Faughnan, of AA Ireland, said attempts in the past to put together a database of uninsured drivers were beset by problems around the quality of the information. He said if this can be overcome it should lead to lower premiums. Junior Minister with responsibility for insurance reform Michael D'Arcy said the implementation of the insurance working group's recommendations was a priority. He said he is hopeful there will be a further drop in insurance pricing in the next year.